ST. GEORGE – A Mohave County probation officer who was shot at a St. George office during an alleged “burglary gone wrong” incident in 2013 is now facing charges that indicate he may have actually shot himself during the incident and falsified his story about a scuffle with a burglar. 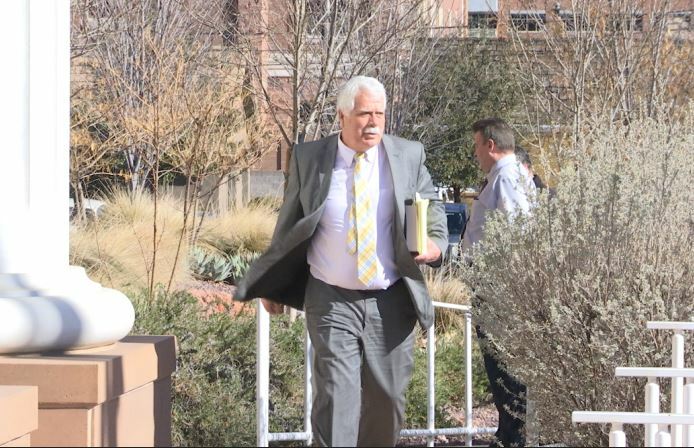 Brian Rees Stephens, 43, of Ivins, made his initial appearance in court Tuesday on charges of second-degree felony communications fraud, class A misdemeanor criminal mischief, as well as class B misdemeanor discharge of a firearm and providing false information to law enforcement. The charges stem from an incident that occurred in the early morning hours of Nov. 15, 2013, in a building located at 435 E. Tabernacle Street where Mohave County Probation Department maintains an office subleased by Attorney at Law Travis Christiansen’s firm. Stephens’ office was located down the hall from Christiansen’s office. Christiansen said that, at the time, he thought Stephens had “saved the day” and intercepted a bullet that Christiansen could have been on the receiving end of. When the gun went off the second time, Stephens told authorities, the alleged burglar – whom he described as a slender man, around 6 feet tall, wearing a black hooded sweatshirt, black pants and a white hockey mask – fled the scene on foot. Stephens reportedly then cleared the rest of the offices in the suite to make sure there wasn’t another burglar and then called 911. Police and medical personnel arrived on scene and Stephens was transported to the hospital for the injuries he received during the ordeal. Fearing that he may have been an intended target, Christiansen said, he and his family left town for a few days and spent a significant amount of money on new security measures. In the early stages of the investigation, Christiansen said, law enforcement asked for information about anyone he had met with or dealt with as a client or opposing party in any litigation within the prior six months before the incident that roughly fit the description Stephens had given of the alleged perpetrator. After taking several months off for medical leave, Christiansen said, Stephens was back working down the hall from him and the two would go to lunch together regularly. The two continued working in the same office suite up until last week when, Christiansen said, Stephens was served with the summons to appear in court on criminal charges related to him possibly making the entire story up. Stephens appeared in 5th District Court Tuesday where his attorney Gary Pendleton requested that Judge John Walton reassign the case to a new judge. Walton granted Pendleton’s request and scheduled Stephens’ preliminary hearing for Feb. 16 before Judge Michael Westfall. Stephens hasn’t tried to contact him since being served with the summons, Christiansen said. He added that he still considers Stephens a friend. Christiansen said he’s not fearful of Stephens and that he doesn’t believe Stephens intended to harm him. When asked if he felt Stephens was guilty or innocent of the charges, Christiansen said it’s too soon to say. A request for comment from the Mohave County Probation Department about Stephens’ charges was not immediately returned. Even my sheep are smarter than this probation fella. Well, I’m going to diagnose him as a psychopath. LOL ! Like you got room to talk ! (Why did it take over two years to investigate this?